There is the old maxim that constraints fuel the creative process. 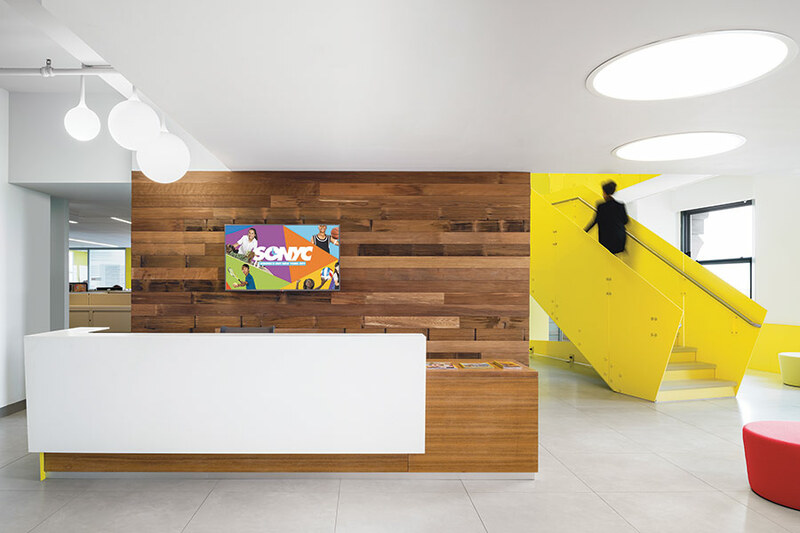 And in the case of the Court Square Building at 2 Lafayette Street, it was the challenge of meeting the diverse needs and goals of two very critical, yet different New York City agencies that stoked the imagination of local firm BKSK Architects. 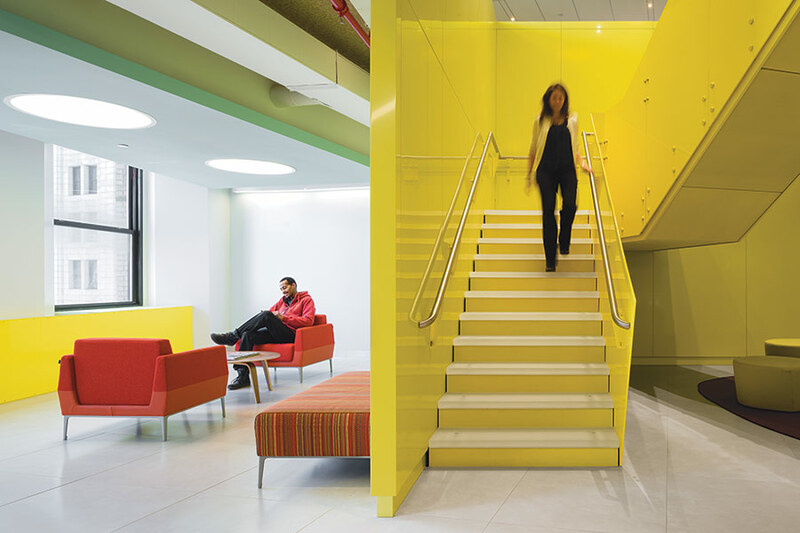 This process yielded a lively and cohesive workplace for both occupants and the multi-generational New Yorkers the two departments serve. The project—which began during the Bloomberg administration and wrapped up under the office of Mayor Bill de Blasio—called for the renovation of seven floors in the historic municipal building in Downtown Manhattan to house the Department of Youth & Community Development (DYCD) and the Department for the Aging (DFTA). The design was guided by early conversations with the clients, addressing the specific objectives and requirements of each agency. While serving different subsets of the population, both needed dedicated public spaces for such programs as staff training and computer classes as well as clusters of open offices, conference rooms, and breakout areas for employees. The firm designed the interior spaces to be as comfortable and energy efficient as possible with the aim of LEED Gold certification. Such measures as reinsulating the envelope, insulating the windows with sprayfoam, and implementing new valves on the radiators enhanced the overall energy efficiency of the building. BKSK’s design serves the varied programmatic needs of two city agencies occupying 7 floors. 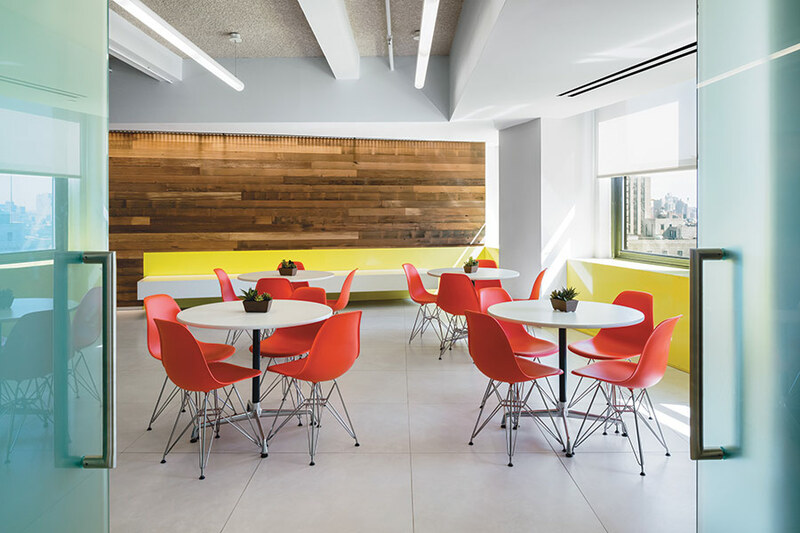 Bright colors punctuate the communal spaces, and a more neutral palette is used for the open offices. The interiors, prior to renovation, showed years of wear and poor design: natural light was not penetrating the space; the offices were “chopped up”; acoustic drop ceilings made the space feel cramped and small. 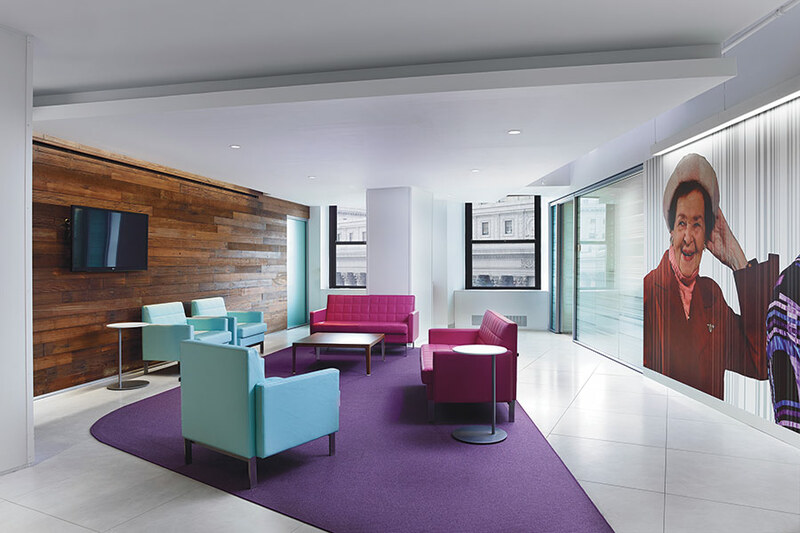 But with the building’s views of Manhattan’s stately Civic Center and an interesting floor plan, the firm saw opportunity to transform the bleak interiors into a light-infused workspace that facilitated collaboration and connectivity. When conceiving the 6th floor offices for the Department for the Aging (DFTA), BKSK had to take into consideration the older population who would be visiting the agency to access the many resources and amenities offered, such as technology training and employment services. Speckled throughout the floor are areas for engagement with the senior visitors, including meeting spaces, practice interview rooms, and computer labs. “This was one of the only floors where they [the staff] are engaging with the public, whereas the other floors are about the people behind the people,” explained Jennifer Preston, BKSK’s sustainable design director. “There had to be a sensitivity, such as handrails to help people who are aging gracefully navigate the space.” Beyond the necessary functional design components, the interior features whimsical touches such as a super-sized photomural by agency staff photographer Richard Henry called Stylin’ Seniors, which weaves through the space. Floors 14 and 18 through 22 are dedicated to the NYC Department of Youth & Community Development (DYCD) that oversees funding for community-based organizations such as immigration services and youth training. This called for a different approach since the agency interfaces less directly with the public, but has a far-reaching mission that touches many New Yorkers. Breakout areas are interspersed with open office plans with related departments clustered together. BKSK created informal sitting rooms out of leftover spaces along the perimeter of the angled floor plan. By juxtaposing a neutral palette in the quieter workspaces with what Krevlin called “intense pops of color” in more public, hangout spaces, they were able to “break down the scale.” Movement is encouraged throughout the space: A bright yellow staircase connects the 18th through 20th floors and then the 21st and 22nd. “We were trying to have these inviting stairs for easy circulation and fostering connectivity,” explained Krevlin. Recycled wood, from the city’s water towers, clads the wall behind the front desk area (same with the 6th floor) and adds a rustic warmth to the otherwise clean, bright interior.